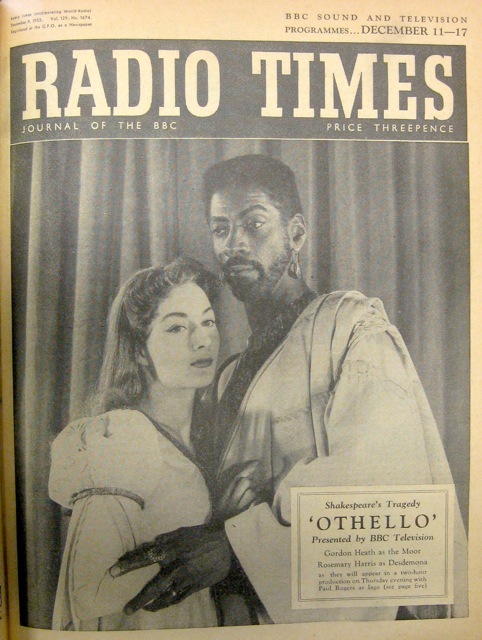 The 1955 BBC production of Othello directed by Tony Richardson is the earliest extant British television Shakespeare. Yet to date there has been comparatively little critical discussion of the show, in large part because it has remained almost unseen across nearly sixty years. The quality of the BBC’s recording is far from perfect, with the early scenes in particular being dark and lacking sharpness (there is also an unmotivated shift away from a lighter image in Act IV Scene 1), but it is unquestionably watchable enough to reveal a richly interesting and often compelling production. Richardson wrote of one of his earlier BBC assignments, The Apollo of Bellac by Giraudoux (broadcast 12 August 1955; a recording apparently exists) that it ‘was thought to be a bit fancy’ (Long Distance Runner, p. 57). And certainly Othello has a number of visual flourishes that could be seen as traces of a young man keen to make his mark. At the end of Act III Scene 3, for example, as Othello says, ‘Now, by yond marble heaven…’ there is an impressive (even if not entirely smooth) ninety-second crane shot that rises up above the Moor and then brings Iago into shot as he makes pledge of his service. In Act IV Scene I, Othello listens to Iago and Cassio hiding behind a net through which we can see his jealousy, even as he is supposedly masked from the others. 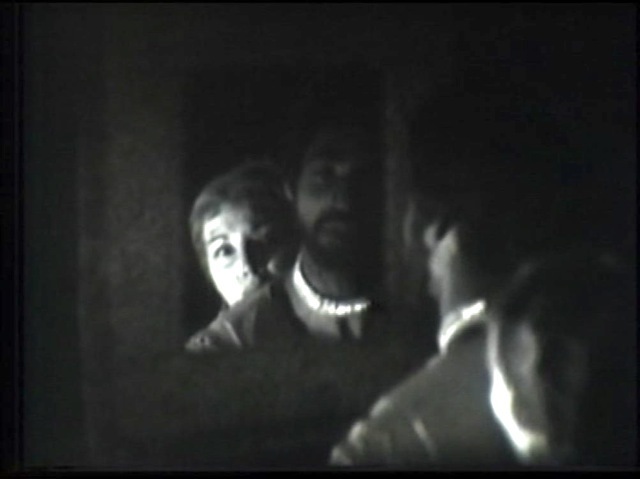 And in the following scene there is an impressive mirror shot with Desdemona and Othello seen as themselves and as reflections (the screengrab, left, perhaps gives a sense of this). For the end too, as the text closes with Othello’s ‘To die upon a kiss’ (the subsequent lines are cut) the camera, again mounted on a crane, pulls up and back to show the former lovers sprawled across the bed. For a version that plays at two hours and five minutes, there have inevitably been cuts, but these have for the most part been made sensitively throughout. In Act III Scene IV the exchange between Desdemona and the clown is cut, but the most significant editing is in Act V, when the first scene is much abbreviated (and the character of Othello makes no appearance), and so is the second, with all the details of Rodrigo’s letter excised. Played once the scene has shifted to Cyprus in one inter-connected set, the production has a confident fluidity suggestive of the complex studio choreography that is more usually associated with ‘golden age’ live drama in the United States. (See Anna Everett, ‘”Golden age” of television drama’, The Museum of Broadcast Communications which also has a strong list of recommendations for further reading.) 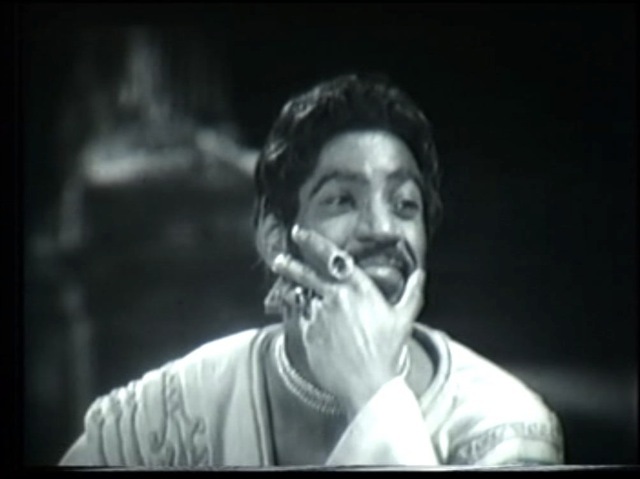 Of the live productions from British television in the 1950s that I have seen, Richardson’s Othello is certainly among the most visually achieved. Intriguingly – and this too must have been Richardson’s interpretation – both Iago and Emilia speak their soliloquies directly to camera, establishing a complicity with the viewer in the former’s evil and the latter’s naiveté. 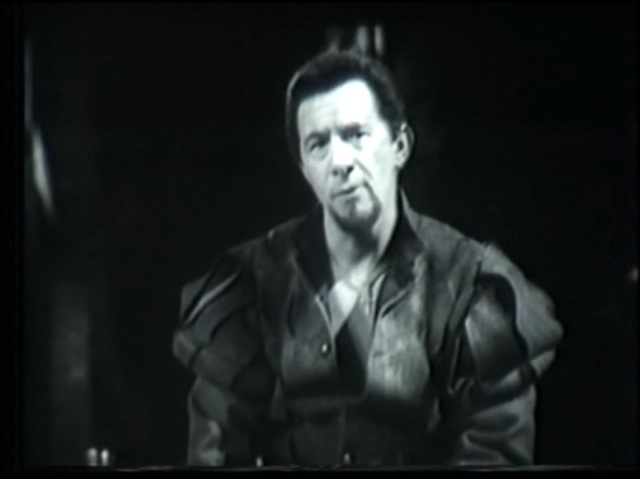 Paul Rogers is particularly good in Iago’s soliloquies, which contrast with Othello’s for which Heath does not address the camera.